I have posted a few times about the book by J. Rodney Turner and Ralf Mueller called, Choosing Appropriate Project Managers. The book details the research conducted by Turner and Mueller on 400 different projects; some that succeeded and some that failed. The study looked at the competencies of the project managers and specifically those competencies that were related to project success or failure. The book is packed with information and it has taken me some time (and some help from Mueller) to unpack it and understand how to apply it. The first part of my analysis was figuring out which competencies led to success for each type of project. This was complicated somewhat by the depth of the analysis. You could keep it simple by just looking at the type of project studied, such as Information Technology, Engineering, or Organizational Change. You could further fine tine the requirements by including some of the other project attributes such as project complexity, importance, and contract type. The chart below is what it would look like if you kept it simple, based only on type of project. 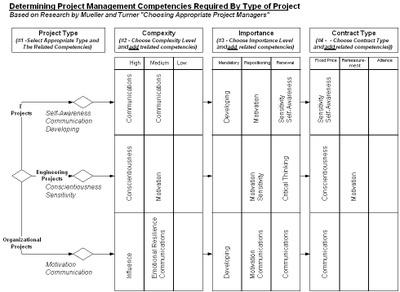 For each type of project, you are more likely to succeed if you have the competencies shown in the chart. If you wanted to fine tune the analysis using the project attributes, it would look like the chart below (or click here to download the PDF). To use the chart, start with the type of project and select those attributes. Then, add any additional competencies for the project complexity, importance, and contract type. So if you improve self-awareness (3 mentionings), sensitivity (2 mentionings), communications (2 mentionings) development, or emotional resilience, then you have the highest chances to improve your project results." The biggest value of this research is in helping individuals understand what type of training would be most valuable to them or would lead them to succeed as project managers. If you can identify the competencies most important to you, you can train on those and improve your success. That said, it would be helpful to project managers to know what their current competency level is for those project success factors. While Turner and Mueller have some profiles for average project managers, you would have to use an instrument to determine your unique competency levels. The Leadership Dimensions Questionnaire is an instrument that would help you determine your competency levels. Victor Dulewicz and Malcolm Higgs developed the Leadership Dimensions Questionnaire and that is the instrument used by Turner and Mueller as the basis for their study of 400 projects. I will take a closer look at the LDQ in a future post. Nov 25, 2007 10:24:11 PM | applying emotional intelligence, importance of emotional intelligence, project management success, why emotional intelligence for PM?